Records show that there was always a great interest in education in the area. Even before the National education act of 1829 there were two schools in the area. A hedge school in Knocklishen and a school in Tynaclash, Kiltegan. In the return for the year 1827, it was noted that there were 40 small children in attendance at the school in Knocklishen. This school was taught by a man named Edward Darcy. In wet weather they were taught in his house but in fine weather they were taught outdoors. Edward Darcy was succeeded by his son Thomas and his grandson Michael, who emigrated to Australia. The same records show that the school at Tynaclash, Kiltegan had 86 boys and 58 girls. and was attached to the church in Tynock which had been newly built in 1826-27. A public school house was built on the site of an old chapel in Tynaclash , Kitegan- where the community hall now stands. It was destroyed during a fire date and the school was temporarily moved to Barco’s house in Kiltegan. 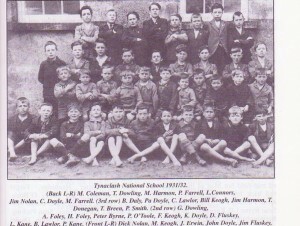 The school in Tynock was built in 1949 by a builder called Michael Hagan from Arklow. It was a three classroom school with cloakrooms and toilets. There were fireplaces in the classrooms to heat the school. Mr Moriarty was the Principal and Mrs Moriarty named the school as she had a great belief in Saint Therese.The school was refurbished in 1983 and the teachers and pupils worked from the curate’s house in Kiltegan. The school was extended in 2011 to add another classroom, a staff room and additional toilets. There have been three principals in Tynock NS since 1949. Aidan McNamara succeeded Michael Moriarty in 1978 and Jean Pender became principal in 2011. Some of the teachers who have taught in Tynock NS include Eileen Lyons, Noirín Moore, Maire Ni Shé, Bríd Ní Shiocrú Kathleen Keane, Mary Lacey, Clare O’Neill. Mrs K O’Toole pubished extracts was referenced when writing this piece.